VERNON, Calif. (December 2, 2015) - As the FDA clamps down on artificial trans fats in processed foods, a new consumer survey from Coast Packing Company and Ipsos Research indicates that younger Americans are more receptive to animal fats in their diet than their elders -- and are eating accordingly. The survey of 1,000 adults, conducted in mid-November, examined how attitudes about animal fats in the American diet have changed in recent years – and how consumption patterns may be changing as well. Respondents were asked whether they were more or less open to animal fats, and whether those views extended to actual behavior. The clear finding: where animal fats are concerned, youth will be served. According to the survey, those in the 18-34 age bracket are twice as open to animal fats as the next oldest group (35-54) – 15 percent to 7 percent — and three times as open as those 55 and over (5 percent). 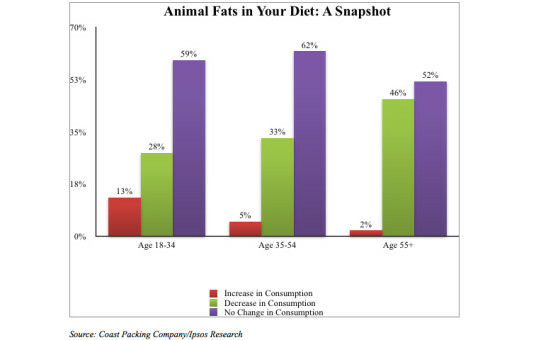 Behavior does indeed follow attitudes: by a wide margin, those 18-34 are leading the charge back to animal fats. Fully 13 percent say their consumption has increased – dramatically higher than those 35-54 (5 percent) and those 55+ (2 percent). Just 28 percent of those 18-34 say they have reduced their intake of animal fats, vs. 33 percent of those 35-54 and 46 percent of those 55+. Age is the most decisive differentiator among the various demographic filters, the survey found. Flipping the age bracket around, a greater percentage of those 55 and up were less open to animal fats (35 percent) than any other age group, by a roughly 10 percent margin. Those 35-54 were most set in their ways, with 67 percent indicating that there had been no change in their attitudes in recent years. By gender, men are more open to animal fats than women (11 percent, compared to 7 percent for women); similarly, a smaller percentage of men reported being less open to animal fats (27 percent, to 31 percent for women). One other key variable is the presence of children in the house. Those with kids were twice as open to animal fats in the diet as those without (15 percent to 7 percent). Employment status also appears to have some impact on attitudes. Those employed part time were the most open to animal fats of any segment surveyed (17 percent vs. 9 percent for those employed full time and just 6 percent for the unemployed). According to the Coast/Ipsos study, consumption patterns generally track attitudes. More than twice as many men reported an increase in their consumption of animal fats (9 percent), vs. just 4 percent of women. Conversely, 40 percent of women reported cutting back on animal fats, vs. 32 percent of men. Again, the presence of children in the house seems to make a difference in consumption patterns – 11 percent of those with children reported increased consumption of animal fats, vs. a 5 percent increase among those households without children. As with the attitudinal findings, employment status factors in; 14 percent of those employed part-time reported increasing their consumption of animal fats, nearly three times the rate of those without employment (5 percent increase in consumption) and those employed full-time (6 percent). Finally, twice as many non-whites reported increasing their consumption of animal fats (11 percent, to 5 percent of whites). “While we’re heartened to see the generational shift, we recognize that traditional ways of thinking and eating don’t change overnight,” Gustafson said. “It’s important to recognize first and foremost the natural makeup of both lard and tallow. Neither contains the artificial trans fats you find in hydrogenated shortenings. We believe strongly that these products are best when minimally processed, which is consistent with the whole movement in food and cooking right now. The Coast Packing/Ipsos study was fielded from Nov. 16-18, 2015. Ipsos eNation surveys consist of a minimum of 1,000 completes with adults 18 years of age or older in the contiguous United States. The sample includes individuals selected from the online segment of Ipsos’ iSay/Ampario Panel, and is balanced to be representative of the general population based upon region, gender, age, and household income data from the U.S. Census Bureau. Results have a margin of error of +/- 3 percentage points. For a copy of the survey results, please email admin@edgecommunicationsinc.com. Ipsos is a global independent market research company ranking third worldwide among research firms. The Ipsos team is passionately curious about people, markets, brands and society. Ipsos makes our changing world easier and faster to navigate, and inspires clients to make smarter decisions. The company delivers research with security, speed, simplicity and substance. Ipsos is one of the world’s largest independent market research companies, and in 2015 it is celebrating its 40th anniversary.